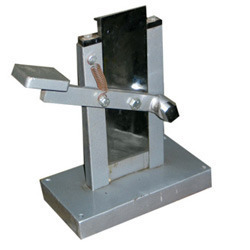 The aluminum tube crimping machine offered by us finds applications in a wide variety of industries. The machine can crimp aluminum tubes. It is having arrangement of coding simultaneously at the time of crimping. With the support of our adroit team members, we have become one of the noted manufacturers and suppliers of supreme quality array of Industrial Machines such as Oscillating Granulator, Tray Dryer, Vibro Shifter, Liquid Filling Machine, Liquid Mixer, Filter Press, Colloid Mills, Double Cone Blender, Dehumidifier, Packing Belt Conveyor, Vibro Sifter, Ointment & Cream Section, Spatula, Cupboard, Digital PH Meter, Microscope, Disintegration Tester, IR Moisture Balance, Dissolution Tester, Friability Test Apparatus, Hot Air Oven, Vacuum Oven, Incubator, Rotary Vacuum Suction Pump, Water Bath, FBD Bags, FBD Sieve, Dryer Trolley. These products are highly treasured in the domestic market for their longer service life, corrosion resistance, efficient functionality and optimum performance. Also, we provide excellent product modulation facility to our clients in accordance with the specifications and instructions. Our well developed infrastructural facility is segregated into various functional units such as manufacturing, quality control and R&D, which are connected with an integrated system and manned by specialized professionals. We conduct severe tests of the offered products at our in-house quality testing unit using latest testing tools and equipment to ensure their compliance with international quality norms. For the convenience of our clients, we offer various payment terms such as (D/A, D/P & TT) and payment modes (Cash, Cheque & DD) to facilitate the transaction process.